Nogeh (centre) receives the 1st Degree Black Belt Award presented by ITF Headquarters Korea representative Peter Timik. 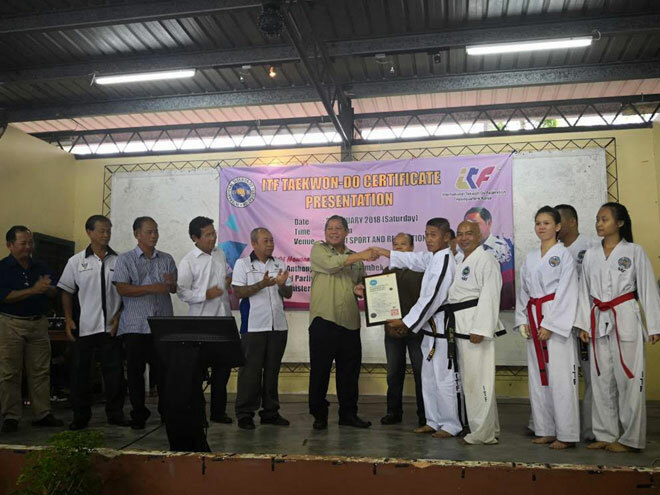 BAU: Mas Gading MP Datuk Anthony Nogeh Gumbek has lauded the efforts of Singai Sports and Recreational Club in promoting taekwondo in the constituency. He urged the club to continue promoting the martial art among local youths here as it can inculcate high sense of discipline and responsibility among its members. He also pledged his continuous support to the club towards producing more national or international level exponents from his constituency, particularly in the up-coming Asia Taekwon-Do ITF Championship 2018 in Kuala Lumpur. Nogeh, who is also Deputy Minister of Agriculture and Agro-based Industry, said this at the presentation of upgrading certificates to 72 taekwondo members of Singai Sports and Recreational Club, including those from Serian, held at the club hall in Kampung Sudoh, Singai near here recently. During the function, Nogeh was also presented with 1st Degree Black Belt Award from ITF Headquarters Korea by its representative Peter Timik, the club’s taekwondo chief instructor. several other local community leaders from Singai were also present.